Some will tell you luck is where preparation meets opportunity, and they were prepared. Definitely true. Successful people write books and do interviews to tell us how they made it, and we try to replicate their success. This doesn’t work, because you won’t have the same type of luck they did. 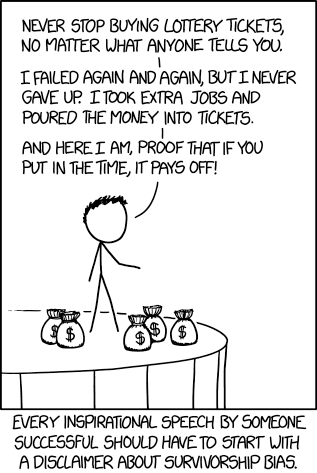 Successful people tend to have survivorship bias, they think others can imitate them to succeed. This is like a lottery winner telling you what numbers they used. Hearing about how someone else made it isn’t always helpful to those trying to replicate their success, because luck played a role. Steve Jobs and Bill Gates were lucky to be born in the exact years that put them in adolescence during the advent of computers. They grew up with access to computers before they were in homes, which they would not have had if they were born anywhere else. Without this type of luck, they would not have started Apple and Microsoft. Some people were lucky to release products at the right time. 2008-2010 were fantastic years to build digital products, and many who did have become very successful. Some of these people were visionaries, but most of them were lucky. Everyone needs luck to become really successful. If you can’t be successful doing what someone else did, what can you do? You can make your own damn luck. If you listen to enough stories of successful people you’ll hear the real reason they win, they made their own luck. Ben Mezrich was rejected 190 times and wrote 6 books that no one read before hitting it big with the book that became the Social Network movie. Chris Sacca lost 1 million dollars doing leveraged stock market trades before he became a billionaire investor. He had to work side jobs to pay it all back and start from zero. James Altucher made $10 million selling his company, then lost it all. He rebuilt his career after being suicidal. JK Rowling was a jobless single mother, rejected by 12 different publishers before she found one who would take on Harry Potter. Mezrich, Sacca, Altucher and Rowling succeeded partially because they kept at it until luck was on their side. Are you willing to stick around long enough to make your own luck? Great and inspiring post Scott. Thanks for sharing this. In my opinion, the only time luck is a factor is when you meet the woman of your dreams at a bar where old people sing karaoke or you slip on a banana peel and get hit by a bus. What are the chances of either happening? Slim to none, right? Personally I think I’m lucky, because a lot of things happened that were outside of my control to give me opportunity. I was born in a safe neighborhood in the US and got a great education. I have two loving parents who invested in me with time and energy. I started a business that has been mildly successful, not because I’m smart, but because I took a chance and it paid off. All of those things could have gone differently. However, the harder you work the luckier you get. So I agree with you on that 100%!